In honor of Julia Child's 100th birthday, we are revisiting Mastering The Art of French Cooking. I got to spend Julia Child's 90th birthday with her and a few thousands of her closest friends. 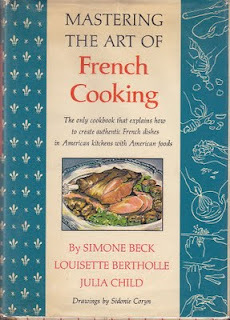 In 2009, my friend Ann, signed me up to cook a recipe from Mastering The Art of French Cooking. Of course, I couldn't cook just one. Today’s post is the ninth in a series of weekly Julia Child recipes. Kudos to this week’s contributors, project manager Ann Burrola and her friend Lucinda, who not only prepared Pâté de Canard en Croûte (Boned Stuffed Duck Baked in a Pastry Crust), but also made baked cucumbers AND blackberry flan. This week’s recipe for the Pâté de Canard en Croûte covers 7 pages in Mastering the Art of French Cooking, Vol. 1. This is certainly not a record for a Julia Child recipe (French bread covers 22 pages) but, based on this alone, the recipe could be considered daunting to any cook. What are we saying? A recipe that requires deboning a duck, preparing stuffing, sewing the stuffing into the duck, making a pastry crust, wrapping the duck in the pastry, and then decorating it with pastry cut-outs, is daunting! However, Julia provides detailed written instructions and clear illustrations so that anyone will know exactly how to accomplish the simplest and most complicated dishes in her cookbooks. “You’ve got all the directions and if you can read, you can cook,” she wrote. When I saw Julie & Julia, someone asked me if I had ever made the stuffed duck. I hadn’t, but thought I might give it a try. “Great,” Ann said, “you make the duck.” Ann didn’t know the recipe is seven pages long, with an eighth page for the farce or forcemeat stuffing. The recipe has three main components. The farce, which is stuffed into a de-boned duck, which is then wrapped in a crust. I made the forcemeat and the crust and set about to de-bone the duck. De-boning a duck takes about 45 minutes. Julia says if you de-bone a lot of them you can cut your time by 25 minutes. One was enough. Ann timed it. It took 45 minutes. Once I had the duck de-boned, I stuffed it with the farce. Then it needed to be sewn up. At this point, I was really glad that I never went to medical school. Once the duck is stuffed you brown it. Then wrap it in a pastry crust. Of course, Julia wants the crust decorated. Now the duck goes into an oven for 2 hours and time marches on…. About 5 1/2 hours into Pâté de Canard en Crouté, it was time to start the vegetable. Ann peeled, seeded, and cut her cucumbers for her Concombres au Beurre—basically, cukes baked in tons of butter! In keeping with the “Julia aesthetic“, Ann ventured to Washington's Eastern Market in search of a fromagerie to acquire the proper butter. Sticks of American butter from the Safeway, with their skimpy 80% fat content, would not do. For Julia, we needed a block of European-style butter with its slightly higher fat content. We found the recipe for Clafouti aux Mûres and gathered the ingredients. While the cucumbers baked, we made the batter for the clafouti and got it ready for the oven. In the movie Julie & Julia, Julie talks about de-boning her duck but she never mentions the presentation. After you bake and cool the duck, you have to carefully cut it out of the crust while leaving the crust in tact. You take the now cooked duck and remove all the trussing string. Then, you re-stuff the duck into the crust for a lovely presentation. The key to the long-lived appeal of Julia Child was her ability to get us into the kitchen without fear, to move us out of our comfort zone and try something new, and most importantly to have fun. I love a challenge and nothing says “challenge” like ten pages of recipe! Ann wanted to take part in the blog and have fun in the kitchen. What could be more fun than taking plain old salad cucumbers and transforming them into Concombres au Beurre? I may never make Pâté de Canard en Crouté again, but when I see a non-descript salad with slices of cucumber tossed on top I will think of how much better they would be had they been cored and sliced and baked in rich butter the way Julia taught Ann to do it. I will remember the unctuous duck, the succulent cucumbers, the clafouti with blackberries from my garden and the sound the wine glasses made as we toasted Julia.